I am thankful for this invitation which was made very much in the spirit of John 17, and honoured to be addressing sisters and brothers, some of whom I know quite well, having served in the ecumenical life of these four nations for over 15 years. I also share my prayers with you today for my brother Angus Morrison who is not here. I greet you in the name of Churches Together in Britain and Ireland, and am thankful for the invaluable contribution and input from Scotland in our continuous work. Having said that, I would ask you please not to adjust your sets, because I know that for many I am like a dubbed movie where the picture does not necessarily go with the sound. 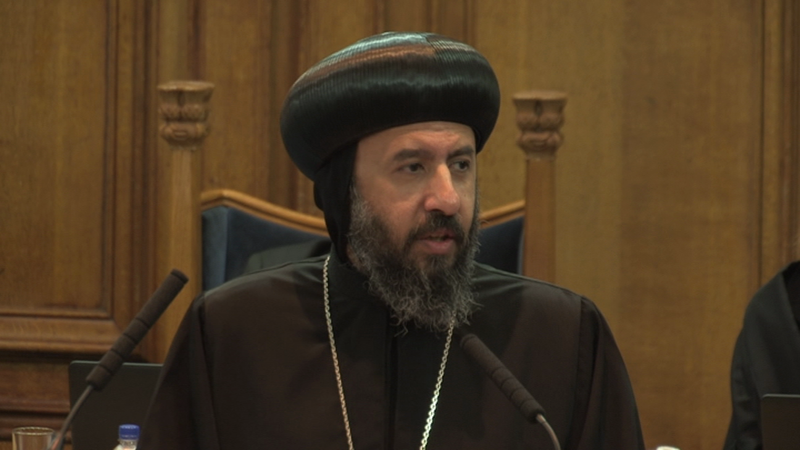 Who would expect an Orthodox bishop to say something that not a single person here would actually object to…so far? Moderator, I must confess that I was slightly confused sitting up there in the gallery, because I knew that I had arrived in Edinburgh but did not expect the words of certain very influential figures from Liverpool who would start our day. This is indeed “the day the Lord has made, and we rejoice and are glad in it“ . A few years ago I was driving to one of our parishes and stopped hurriedly at services to refuel my car. A scruffily dressed gentleman said to me ‘good morning padre’ and I said ‘good morning’. He asked, ‘so what Church are you with?’ and I thought, it is too early in the day to go through the Greek, Russian, Serbian scenario, so I said ‘I am Egyptian Orthodox,’ to which he replied ‘O, so you’re Coptic?’. That said, I never wish to be put in that position again. Egypt is a place in which Christianity has survived for over two thousand years, having been preached by the evangelist and writer of the Gospel, Saint Mark, with an unbroken presence there since then. It is a place of great influence as the birthplace of monasticism and the Fathers of the Faith, such as Athanasius and Cyril. Egypt also has a rich heritage of martyrdom in which people, over generations, have died solely as a result of being Christian. In Isaiah 19 we also encounter a very particular blessing upon Egypt, God’s people, because it was the place of refuge for Him as an Infant before He returned to begin His ministry. Over the past years Christians have been very much a part of the life of Egypt. Since the uprising of 2011, whether it was in Tahrir Square, Maspero, Mr Mohammed Morsi becoming president and an Islamist party coming in, or in the second uprising on the 30 June 2013; Christians were very much a part of every element, and were involved faithfully, lovingly, and diligently, while at every moment paying the price. Having said that, and with this grand idea of revival uprising and the near anarchy that followed, there were more attacks on, and deaths of, Christians in the two years post 2011 uprising than the twenty years prior. Throughout this whole conversation there was the idea of whether or not this was a ‘military coup’, with discussions about whether Christians were pro or anti-military. What was their position? Their position was that they were Egyptians; descendants of the Pharaohs, living as Egyptians. As many of you would have followed the news, the then president was removed and his followers insisted on his reinstatement with demonstrations in Cairo. When dispersed, they chose to blame the natural scapegoats, who were the Christians. In 48 hours, in August of that year, 50 churches and 50 other places of Christian ministry, including orphanages, schools, and Bible societies, were attacked. This was unprecedented. Yet what was even more unprecedented and unexpected was the reaction…which was absolutely nothing. Miraculously, and superhumanly, there was not a single act of retaliation, violence, or vengeance from the Christian community. I hasten to say that there was no memo that went out saying ‘do not react’, and there was no general communication that alerted people to hold back. They were just Christians living as Christians; the “salt of the earth and light of the world”. Christians were well and truly turning the other cheek, because not only did they not retaliate but they wrote on those same charred walls of their homes, (and the Church there, as I was explaining last night over dinner, is not your typical city Church, it is more the village Church where it is part of everyone’s life, where people are born, baptised, and married, and where they share their joys and their sufferings); and wrote “you have heard it said it is an eye for an eye and a tooth for a tooth, but I say to you ‘love your enemies’’, and the hand of love and reconciliation was extended. This was very simply an act of living Christianity as it should be lived. In the presence of Their Graces, I must make mention of a very special visit to our Coptic Orthodox Church Centre in December of last year by His Royal Highness The Prince of Wales, who came purely to show a sense of solidarity and support to Christians in the Middle East. His words were gracious and uplifting for people who were living in the midst of this to hear; and he said that there was a debt of gratitude and respect owed for Christians living their Faith in the face of such attacks. Our heart bleeds for everyone who lost their lives, because mother’s hearts do not mourn differently whether their sons are Coptic Orthodox Christians, or Islamist fundamentalists. They are still mothers; children are still orphaned, communities are affected. In this setting it is our role to be reconcilers, to transform this place of conflict and death, through the light of Christ, to be a place of hope; and we are hopeful. In speaking about Egypt, many people think they are going to hear a plea for pity from me, yet this is not the case. Although I ask you to pray for Egypt and the Middle East, for Syria, Iraq, and Palestine, and for everyone who is there, we believe there is a certain grace given to us in proportion to what we live. We live our own struggles here in the West, but those who live greater struggles elsewhere, and it is not just the Middle East, it is Nigeria, China, Korea, many other places; they are given grace for that which they live. The concept of enemy, and to “love your enemy” is one that I struggle with constantly, and a passage that I have frequently thought about. I have come to the realisation that as a Christian I do not, and must not, have enemies. The enemy referred to is the one who considers me as his or her enemy, but I must continue to love them and overshadow that enmity with love, breaking that darkness with light. Having this reconciliation and that peace does not mean however that we do not advocate for others. The first religious shrines attacked in Egypt where not Coptic Orthodox Churches, they were Sufi Shrines; so advocacy as Christians, is one of our responsibilities. We call for truth graciously, lovingly, patiently, yet powerfully, with the example of our Lord Jesus Christ Himself. Reconciliation is the only way ahead. 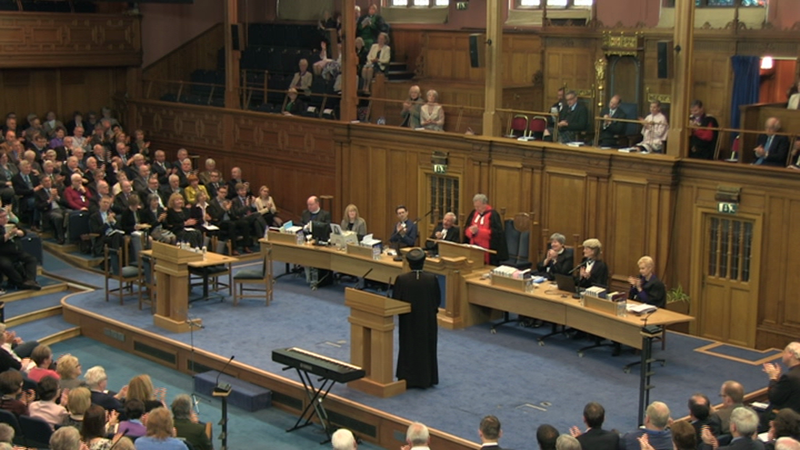 I know that you are making one or two decisions of your own here, and the Church in Scotland has presented such a wonderful model of conversation, but you will also be a source of reconciliation and act as reconcilers. I believe, as a clergyman, as a head of Church and as a Church, we should very seldom sit on sides of an argument unless they contradict a Scriptural reality that we must be living. If we as a Church come down on a losing side we appear to be powerless, yet on a winning side we appear to be treacherous; whereas if we are there to reconcile people then that is what is needed. We are approaching a very important Feast for us all as Christians, that of Pentecost. That day when people were gathered together “with one accord, in one place”, as we are today, is similar to this Christian fellowship and oneness of the Body of Christ across borders, denominations and perceptions. I know it sounds cliché but what we have in common is far in excess of what separates us, and that is what we must live with; the hope that we are one. As we approach Pentecost we know that in that same room where they were gathered in prayer, there was the sound “as of a mighty rushing wind”,and that it not only “filled the whole house”, but extended into their society, leading to the conversion of 3000 souls. From there into the whole world and across generations, and as a result we now stand here together today. This is what I pray for you and this Assembly: that the mighty rushing wind that inspires you here also goes into this nation, our nations, and into the whole world. WE are the Body of Christ…YOU are the Body of Christ. I pray that in our common witness and example, and in our common life, we continue to be light in what sometimes appears to be an ever darkening world. We must provide hope to what wrongly appears to be a position and a situation where there is none; for our hope is in the living God, Who was, is, and will always be. 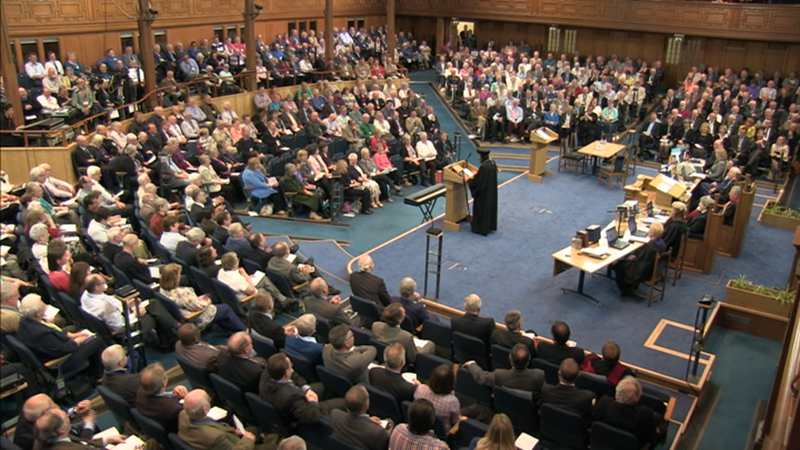 0 Comment(s) to the "Address by HG Bishop Angaelos to the Church of Scotland General Assembly"